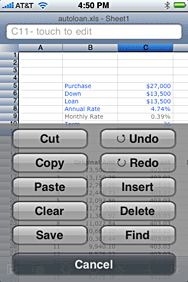 Back in March, I reviewed Mariner Calc 1.0 ( ), a program that lets you edit Excel spreadsheets on your iPhone or iPod touch. At the time of my review, I had a few key issues with the program. There wasn’t any way to add folders or otherwise sort your files, you couldn’t e-mail a worksheet to someone, there wasn’t any way to save your work in progress, and the program was quite unstable. In addition, the program only really handled one—the absolute simplest one—of my four test spreadsheets properly. Saved by the Button: Mariner Calc now includes a Save button within the editing screen, making it easy to save your progress. With the recent release of Mariner Calc 1.2, however, many of those concerns have been addressed, although there’s still no way to e-mail a file off the iPhone nor to sort your files. However, stability is greatly improved—I’ve yet to experience a crash while using this version of the program. Equally as important as the stability are the improvements in the program’s handling of Excel files. Out of my four demo files, the only one that really doesn’t work right is the complex example, which contains array formulas. The simple and medium sheets now work perfectly, including the fancy mixed text and numeric calculation I use on the medium-difficult example. With these improvements, Mariner Calc is now much more useful for editing Excel files on the go. There’s also a new Save button within the editing environment, so you won’t lose all your work if the program does happen to crash. There’s no Save As, so if you want to duplicate a worksheet, you’ll need to do that from the Mariner Calc file management screen. Mariner Calc still has some issues if you’re going to move files back and forth between Mac and iPhone and edit them on the iPhone. When you move such edited files back to the Mac, you may find certain customization and formats gone. For example, merged cells are removed, and custom row heights are all reset. Some users have reported issues with print areas and margins changing, though I haven’t seen that myself. Overall, these are nice improvements in Mariner Calc. Though it’s still missing e-mail capabilities, as well as any way to organize your files, the programs editing skills are now at least equal to those of Spreadsheet and Quicksheet, my two other favorites in this niche.